Weren’t scientists all predicting global cooling in the 1970′s? Didn’t “Climate Gate” show that the science of global warming was based on fabricated data? How can there be global warming when last year was so cold? Why do we think climate change is being caused by humans? How difficult will it be to limit future climate change? Are Humans Increasing Greenhouse Gas Concentrations? How can we predict the weather 100 years from now? How do we know that the world is warming? How can we project climate change out toward the end of the century when we can’t even predict the weather 2 weeks from now? How can there be global warming when last week/month was so cold? Don’t humans produce just a small percentage of the total carbon that is emitted into the atmosphere? An important distinction between the terms “weather” and “climate” is often misunderstood. Take a walk and notice the temperature, humidity, and wind direction. You are observing the weather. Weather happens at a specific location and time, and it changes from hour to hour and from day to day. Climate, however, is the accumulation of weather statistics taken over a long time period, and you need to gather a lot of weather data before you can determine the climate. Take summer in San Francisco as an example. San Francisco , on average, has a maximum daily temperature of 69 degrees F (20.5 degrees C) during July. This climate information, accumulated over the past thirty years of July weather, tells us what the average weather is like for that month. However, on any given day in July, the weather can be quite different, as tourists often discover when the cold fog rolls in under the Golden Gate Bridge . Climate is what you expect the weather to be, but, of course, on any given day the weather can be very different. Climate change refers to the variations in the Earth’s climate (e.g., temperature or rainfall) over time due to natural or human-related factors. Historically, the Earth’s climate has warmed and cooled many times in response to natural changes such as volcanic eruptions or changes in the intensity of the sun. “Global warming,” however, generally refers to contemporary climate change and the study of the natural and human-related processes responsible for the warming of the last hundred years and projected warming for the next hundred years. Many of today’s scientists are working in the field of global warming; however, knowledge of past climate change is essential to improving our understanding of present and future climate. Figure 1. Global greenhouse-gas emissions (CO2 e) for different sectors in the year 2000. Thepie chart indicates the percentage of each sector, with the portioning of the energy sector(60 percent) shown on the right. The data were obtained from the Climate Analysis Indicators Too(CAIT) Version 4.0. (Washington, DC: World Resources Institute, 2007) and the analysis includes all available greenhouse gases (CO2, CH4, N2O, PFC, HFC, and SF6). Carbon dioxide equivalent(CO2e) is used to represent the warming potential of all greenhouse gases (i.e., CO2, CH4, N2O, etc.) in a single value. Energy generation is mainly used for electricity and heat; manufacturing and construction; and transportation. The other major contribution to greenhouse-gas emissions comes from land-use change and agriculture. Permanent removal of forests (or deforestation) leads to CO2 emissions because the carbon stored by trees is released into the atmosphere and is not reabsorbed by the regrowth of new trees. Currently, emissions due to land-use change are largely confined to tropical areas in South America, Africa, and Asia. However, it is the demand by the developed world for wood and other land-based products (for example, meat from cattle and biofuels from sugarcane) that is the driving force in deforestation. 1. Carbon dioxide equivalent (CO2e) is used to represent the warming potential of all greenhouse gases (i.e., CO2, CH4, N2O, etc.) in a single value. 2. U.S. Department of Energy, Energy Information Administration, Emissions of Greenhouse Gases in the United States 2003 (Dept. of Energy, 2005) , https://www.epa.gov/sites/production/files/2015-12/documents/05cr.pdf, accessed Jan. 25, 2008. 3. The data used for this figure come from the Climate Analysis Indicators Tool (CAIT) version 4.0. (Washington, DC: World Resources Institute, 2007). Available at https://cait.wri.org/, accessed Jan 25, 2008. 4. H. Steinfeld, et al., Livestock’s Long Shadow: Environmental Issues and Options (Rome: Food and Agricultural Organization of the United Nations, 2006), http://www.fao.org/docrep/009/a0490m/a0490m00.HTM#Contents_en, accessed Oct. 30, 2007. Which countries are responsible for most of the world’s greenhouse-gas emissions? In 2004, the United States had the largest emissions, followed by China and the European Union.1 Recent estimates suggest that China may have overtaken the United States as the largest greenhouse-gas emitter in the world,2which is remarkable because in 1990, China’s total emissions were less than half those of the United States. It should be noted that a large percentage of China’s manufacturing today is for export to the United States and Europe, and without the demand for these goods, China’s emissions (and economy) would be much less. Insight into the relationship between lifestyle and carbon emissions can be found by looking at per capita CO2 emissions, as shown in Figure 1. Of the top emitting countries, the United States has the largest per capita CO2 emissions, at more than twenty tons per year, with Canada and Australia at roughly similar levels. Other developed countries in Europe (such as the United Kingdom, Germany, and France) have about half the total emissions per capita. China’s per capita emissions, although rising, are still only about four tons, about five times less than the average American. Overall, these results imply that North Americans and Australians are particularly heavy greenhouse-gas emitters (compared with Europeans) and suggest that significant reductions could be made without major changes to standard of living. Figure 1. Per capita annual CO2 emissions in tons per year for a variety of developed and developing countries in 1980 (orange) and 2005 (blue) due to consumption of fossil fuels (petroleum, natural gas, and coal). Data is from the U.S. Dept. of Energy, Energy Information Administration, International Energy Annual, 2005. 1. U.S. Department of Energy, Energy Information Administration, International Energy Annual 2005, https://www.eia.gov/totalenergy/data/annual/previous.php, accessed Nov. 1, 2007. 2. Initial estimates reported by the Netherlands Environmental Assessment Agency show that in 2006 China overtook the United States as the largest emitter of greenhouse gases. For details see: http://edgar.jrc.ec.europa.eu/news_docs/pbl-2013-trends-in-global-co2-emissions-2013-report-1148.pdf, accessed May 8, 2008. 1. The use of tree rings, ice cores, coral reefs, and even historical records such as the time of grape harvest all provide information about the past climate. Information from the NOAA paleoclimatology division provides a good introduction. https://www.ncdc.noaa.gov/paleo/paleo.htmll, accessed May 8, 2008. 3. These data come from the Vostok ice-core temperature reconstruction. You can look at the raw data yourself if you are curious to see how temperature has changed over the last 400,000 years, https://cdiac.ess-dive.lbl.gov/trends/temp/vostok/jouz_tem.htm , or for a good plot of temperature and carbon dioxide over the last 650,000 years, see Figure TS.1. from the 2007 IPCC report. 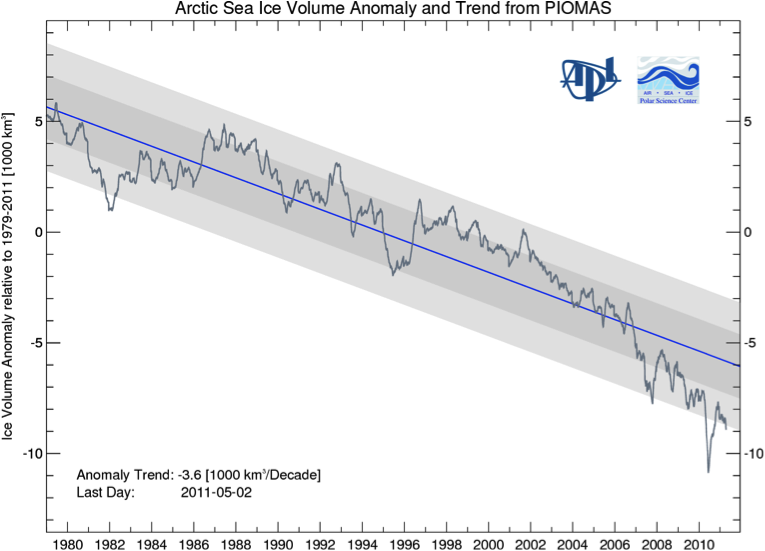 IPCC, Solomon, et al. (2007). “Climate Gate” refers to a situation where the servers of the University of East Anglia were illegally hacked and personal emails from a group of scientists associated with the Climate Research Unit (CRU) were posted online. Thousands of personal emails were published that spanned a time period of over a decade. Out of these thousands of emails, a handful of quotes have been promoted as evidence of a scientific conspiracy. This episode reviews the lines of evidence that suggest human activities are the cause of climate change. -Ocean circulation changes and graphical representation of temperature change on land and oceans. This episode reviews the greenhouse effect and how it relates to human activities and global warming. This episode looks at the evidence that suggests the Earth is getting warmer. This episode talks about our ability to limit greenhouse gas emissions to avoid potential impacts. This episode examines the human contribution to greenhouse gas concentrations in the atmosphere. This episode reviews scientific reports that summarize potential climate change impacts. -Temperature changes in New York and Washington D.C. This episode talks about the methodology for predicting the average weather in the future. This episode explains how scientists use analytical models to evaluate climate, involving both natural and human forcings. This episode investigates social scenarios of the future and how they will influence climate. – How are ideas communicated? – How are climate change ideas communicated? – What choices will humans make in the future about land use, resource exploitation and consumption, etc? To understand the science of global warming, we can start by looking at a greenhouse. Essentially a small house made of glass, a greenhouse allows the sun’s energy to pass through easily while inhibiting the heat from leaving. The Earth’s atmosphere works in a similar way. A majority of the sun’s radiation passes through the cloudless atmosphere and acts to warm the Earth’s surfaces and the oceans. In turn, the land and ocean give off energy that is headed out to space. Most of this energy does not escape to space, rather it is absorbed by naturally occurring greenhouse gases such as water vapor (H2O), carbon dioxide (CO2), methane (CH4), and nitrous oxide (N2O). After they absorb the Earth’s energy, they, in turn, re-emit some of that energy back toward the Earth’s surface and provide additional warming of the Earth. This is what we call the greenhouse effect because, although the sun’s energy is able to pass through the greenhouse gases, these same greenhouse gases trap the Earth’s outgoing energy. Scientists use data from meteorological stations, ships, buoys and satellites to construct instrumental records of temperature as far back as the late 19th century. 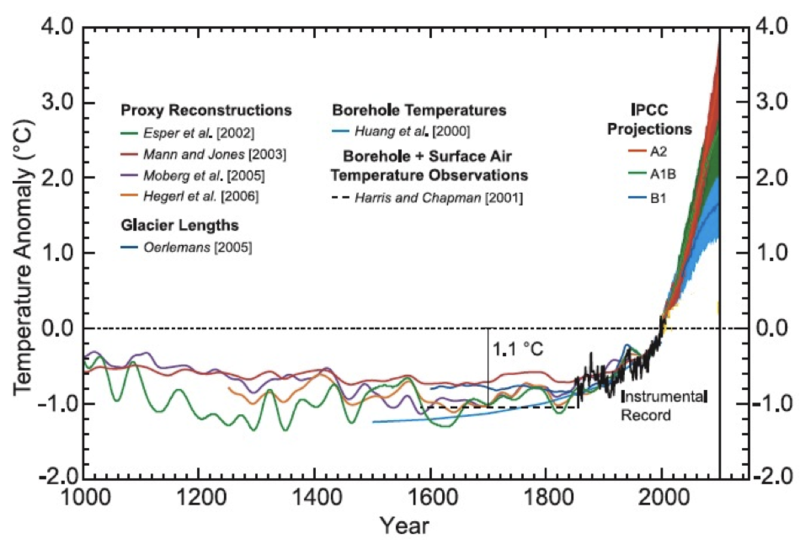 These temperature reconstructions show a significant warming of the globe over this time period (figure 1). 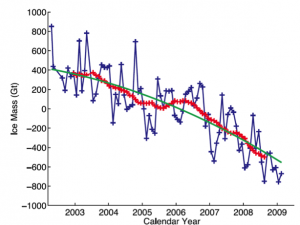 figure 3 – Satellite derived Ice mass in Greenland and Antarctica over the period 2002-2009 (Source: Velicogna, 2009). Velicogna, I. 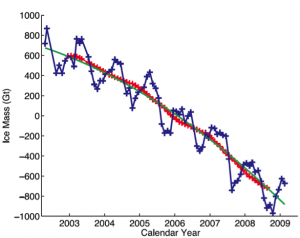 (2009), Increasing rates of ice mass loss from the Greenland and Antarctic ice sheets revealed by GRACE, Geophys. Res. Lett., 36, L19503,doi:10.1029/2009GL040222. Yes. Climate change has occurred many times in the Earth’s 4.5 billion year history due to a variety of causes. Scientists use these past changes in climate to better understand the changes we are currently experiencing. An interesting illustration of human impact on the Earth’s atmosphere comes from Hawaii . 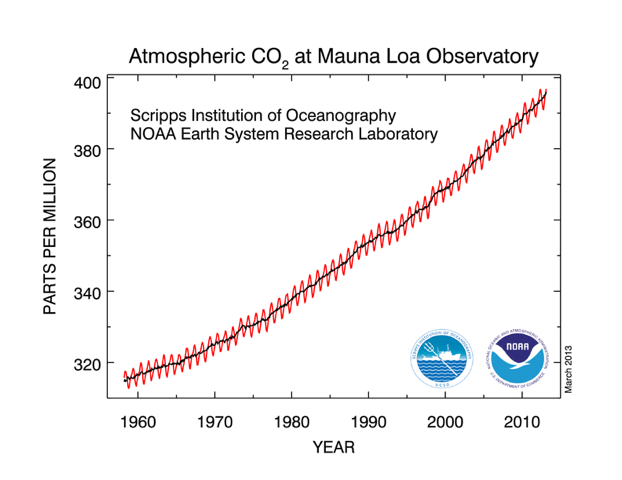 Since 1958, daily measurements of carbon dioxide have been taken from the Hawaiian mountain of Mauna Loa , at 13,680 feet (4,170 m) above sea level. In addition to the steady rise in carbon dioxide, the annual rise and fall of carbon dioxide in the atmosphere is also striking. Every year CO2 concentrations go through a cycle in which they slightly decrease between April and July and slightly increase in September and October. This regular pattern reveals the connection between the atmosphere and all living plant matter on Earth. Here is how it works. In spring and early summer, new growth on trees, plants, and grasses returns with the warming weather. Because plants take in carbon dioxide as they grow, CO2 levels start to decrease, and by the summertime – the peak growing season – CO2 levels have noticeably dropped. In the cooler weather of fall, plants start to lose their leaves which break down and return carbon to the atmosphere, and CO2 levels then start to increase. Some people have suggested that the annual cycle in carbon dioxide is an example of the Earth breathing. During the spring and summer, the Earth’s plant life is growing and thus taking in carbon dioxide, whereas in fall and winter, plants have died back and carbon dioxide is returned to the atmosphere. 1. IPCC, Climate Change 2007: The Physical Science Basis: Contribution of Working Group 1 to theFourth Assessment Report on the Intergovernmental Panel on Climate Change, S. Solomon, et al., eds. (Cambridge: Cambridge University Press, 2007). As the Earth warms, we can expect to see a variety of changes. Direct changes that have been documented during the twentieth century include higher maximum and minimum temperatures; changes in the amount, location, and intensity of precipitation; and a steady increase in sea level. Other manifestations of a warmer world include increases in the severity of drought and in flooding associated with extreme precipitation events.1 For example, Australia is currently in the midst of its worst drought in at least a century, with scientists predicting that parts of inhabited Australia will essentially remain drier during the coming century.2 While many cities have been forced to enact severe water restrictions (e.g., Brisbane imposed level-five restrictions in 2007)3, a number of cities have declared that some level of water restrictions will become permanent. The increased occurrence of drought and floods are in part related to shifts in storm tracks and thus shifts in rainfall patterns. Since modern civilizations have developed around access to freshwater, if there are changes to the locations of freshwater due to lack of rain, inadequate snow/ice melting, or coastal intrusions of saltwater into freshwater lakes, then the viability of some societies could be significantly compromised. Other signals of a warmer world include the increase in intensity of tropical cyclones. Although the connection between hurricane intensity and human induced warming is still an area of active research,4 rising sea levels and, more importantly, increases in coastal populations will make the types of damage seen in New Orleans in 2005 more likely in the future. Less controversial but just as devastating are the increased occurrences of extreme heat events and heat waves.5 The most prominent recent example is the European heat wave of 2003, in which more than 30,000 people died as temperatures soared for weeks.6 Although no single weather event can be attributed to climate change, some research suggests that human-influenced global warming has doubled the risk of heat waves of this magnitude.7 It is also clear that if the warming continues, events such as these are expected to occur more frequently. The impacts of a warmer world affect other biological life on Earth as well. The earlier arrival of spring and the overall warmer minimum temperatures have a particularly important influence on bird and insect migration. For example, disease-carrying mosquitoes are expected to spread to higher altitudes and other areas previously too cold for their survival. Many examples of more northerly migrations are already occurring, ranging from the Pacific starfish slowly migrating north along the Californian coast 8 to the recent arrival of the famously colored puffin birds in northern Alaska.9 These migrations change the natural balance between food and predators and may subject some species to further danger. 1. A good summary of the observed twentieth-century changes and the predictions for the twenty-first century are given in the IPCC Fourth Assessment Report: Summary for Policymakers section of the report. IPCC, Climate Change 2007: The Physical Science Basis: Contribution of Working Group 1 to theFourth Assessment Report on the Intergovernmental Panel on Climate Change, S. Solomon, et al., eds. (Cambridge: Cambridge University Press, 2007), https://www.ipcc.ch/report/ar4/wg1/. 2. B. L. Preston and R. N. Jones, “Climate Change Impacts on Australia and the Benefits of Early Action to Reduce Global Greenhouse Gas Emissions” (2006), http://www.cmar.csiro.au/e-print/open/prestonbl_2006a.pdf, accessed Oct. 31, 2007. 3. Level 5 restrictions include no watering of lawns, limited watering of established gardens on certain days and during certain times, and no filling of pools unless certain other water saving measures have been taken. The Web site of the Brisbane City Council https://www.brisbane.qld.gov.au contains more information about Brisbane’s water situation, accessed May 8, 2008. 6. T. Kosatsky, “The 2003 European Heat Waves,”Euro Surveillance 2005, 10 (2005), 148-49. 7. P. A. Stott, et al., “Human Contribution to the European Heatwave of 2003,”Nature, 432 (Dec. 2, 2004), 610-614. 8. B. Wuethrich, “How Climate Change Alters Rhythms of the Wild”Science, 287 (2000), 793-95. 9. C. Gjerdrum, et al., “Tufted Puffin Reproduction Reveals Ocean Climate Variability, “Proceedings of the National Academy of Sciences, 100 (2003), 9377-82. Local weather is the result of somewhat random fluctuations in the flow of the atmosphere around the planet. This makes the weather at any given location difficult to predict past about a week in time. Climate, or average weather, on the other hand, is largely determined by external forcings that are more predictable. Carbon exists in all living things and has been called the building block of life. Carbon also exists in nonliving things, such as carbon dioxide (an invisible gas) and rocks such as limestone. Our understanding of how carbon moves between the atmosphere, ocean, and land is central to quantifying how increases in greenhouse gases and changes in land surface (i.e., deforestation and soil erosion) will affect climate in the future. 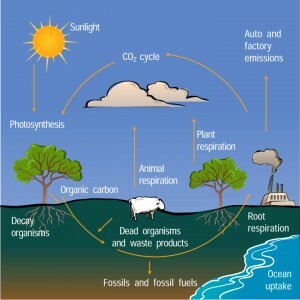 The carbon cycle is a complex series of processes that describes how carbon is exchanged between the atmosphere, ocean, and land (i.e., plants, soil, and the Earth’s crust). One component of the carbon cycle is the exchange of carbon between the atmosphere and plants (i.e., carbon dioxide absorbed by plants via photosynthesis), while volcanic eruptions that inject carbon dioxide into the atmosphere represent an exchange of carbon between the Earth’s crust and the atmosphere. Although carbon is constantly moving between different parts of the Earth, the total amount of carbon on the planet is constant. In this way, if the amount of carbon in the ocean were to go down, then the amount of carbon in the atmosphere or land would have to go up. This property of carbon conservation allows us in theory to keep track of all carbon movements throughout the Earth. Today, the burning of coal and petroleum for energy is just an acceleration of one component of the carbon cycle. For example, the carbon in coal would normally remain in the ground for thousands of years until erosion or plate tectonics eventually released this carbon back into the atmosphere. 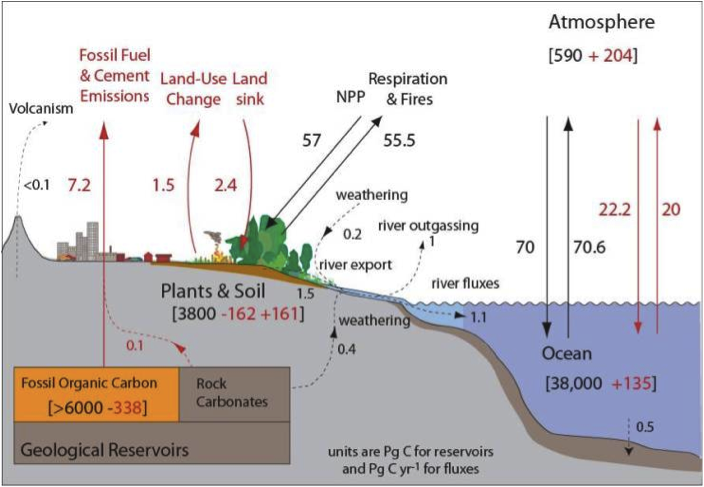 So when humans burn fossil fuels they are really just moving carbon from the land into the atmosphere.1 Well-defined estimates exist for how much carbon goes into the atmosphere each year due to the burning of fossil fuels and changes in the land surface. There are also various organizations that are working to take carbon out of the atmosphere and put it back into the land. For example, the planting of a tree over a period of time will store atmospheric carbon in the trunk, branches, and roots of the tree. However, true to the carbon cycle, if that tree were to burn in a fire, the carbon would be liberated back into the atmosphere. So careful monitoring of the carbon cycle is necessary to understand how human factors affect atmospheric carbon levels and climate. 1. Fossil fuels are a nonrenewable resource, and limited reserves exist on our planet. Estimates vary as to how many years each energy source will be readily available at an acceptable economic cost, and range from ten to fifty years for oil, thirty-five to eighty years for natural gas, and one hundred to two hundred years for coal. The local temperature at any given location is mostly determined by changes in the flow of heat around the Earth’s surface. 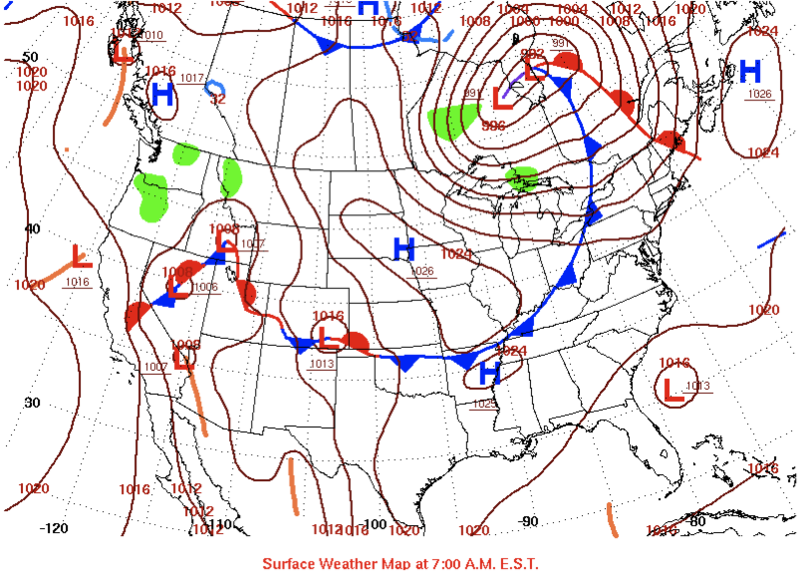 This idea is illustrated in weather maps that represent the movement of cold and warm air with fronts (figure 1). If cooler air moves over a particular location this will generally be cancelled out by warmer air moving over some other location. In fact, the Earth’s average surface temperature only varies by about 0.1-0.2°C from year to year. This means that local weather is a poor indicator of the global temperature and therefore it is quite possible for a given location to experience prolonged cool periods in spite of global warming. Daily observations of temperature have been gathered from meteorological stations round the globe for many decades. 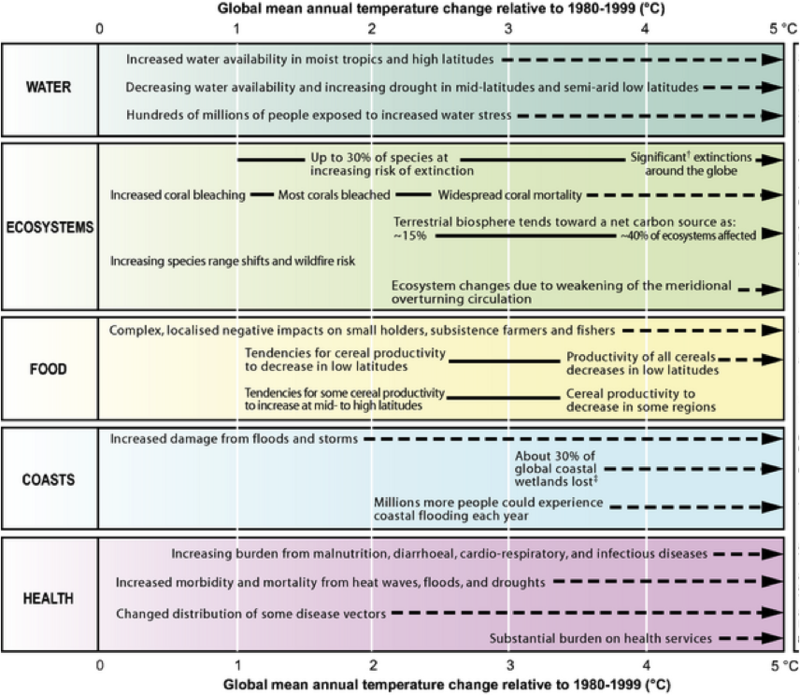 Figure 1 shows global temperatures from 1850 to the present. The most obvious feature is the gradual warming of the planet, although you can also notice decades when the global temperature remained constant or even cooled. These variations reflect the competition between warming and cooling factors, with both natural and human origin. However, the most prominent signal of change has been the steady warming of the Earth since 1970: the warmest years on record (1998 and 2005), the warmest decade on record (the 1990s), and by 2007, eleven out of twelve of the warmest years have been in the past twelve years.1 Clearly, over the last century, our planet has been warming. Other signals of a warming planet or “fingerprints” of climate change have also been identified.2 Fingerprints include the melting of glaciers, the rise in sea level, and the changes in distribution of plant and animal species. 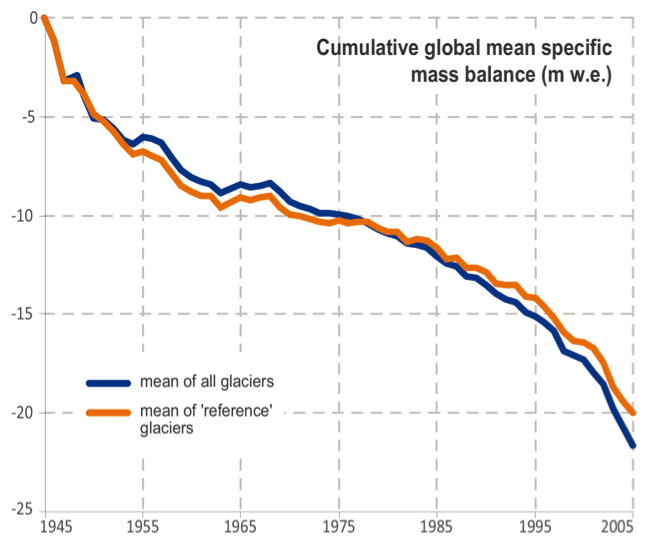 Today most glaciers in the world are in retreat, some of them very rapidly.3 Sea-level rise has also been observed around the world.4 Plants and animals are also sensitive to temperature, and migrations in numerous insect and marine animal populations toward higher altitudes or higher altitudes (where it’s cooler) have been observed.5 Taken together, these collections of fingerprints present further evidence that the planet is warming. Figure 1. Observed changes in (a) global average surface temperature, (b) global average sea level where tide-gauge data is in blue and satellite data is in red, and (c) Northern Hemisphere snow cover for March-April. All changes are relative to corresponding averages for the period 1961–1990. Smoothed curves represent decadal average values while circles show yearly values. The shaded areas represent the uncertainty. info/warming/, accessed Oct. 30, 2007.
nature/links/030102/030102-3.html and a climate fingerprints hot map at https://www.climatehotmap.org/, accessedMay 1, 2008.
messntz/glacierlist.html, accessed May 1, 2008.
pacificsealevel/index.shtml, accessed May 1, 2008. 5. C. Parmesan and G. Yohe, “A Globally Coherent Fingerprint of Climate Impacts across Natural Systems,” Nature, 21 (2003), 37–42. 18. IPCC, Climate Change 2007: The Physical Science Basis: Contribution of Working Group 1 to the Fourth Assessment Report on the Intergovernmental Panel on Climate Change, S. Solomon, et al., eds. (Cambridge: Cambridge University Press, 2007), Fig SPM.3, https://www.ipcc.ch/ipccreports/ar4-wg1.htm, accessed May 8, 2008. Carbon is constantly moving between the atmosphere, ocean, land and biosphere (figure 1). Before humans started burning fossil fuels, all this movement of carbon was balanced so that, over the previous few thousand years, there was no net change in the amount of CO2 in the atmosphere. Ever since the industrial revolution, however, the burning of fossil fuels has introduced a new source of carbon that did not previously exits. This new source is only a small part of the total carbon cycle but it has caused the concentration of CO2 in the atmosphere to increase by nearly 40% (figure 2). Therefore, it is true that humans produce only a small percentage of the total carbon that enters the atmosphere in any given year, however, humans are responsible for almost 100% of the increase in atmospheric CO2 that has occurred since the industrial revolution. Probably the most important tools in use today for understanding climate change and predicting the future are global-climate models. These highly sophisticated models are mathematical descriptions of the atmosphere and ocean. Similar to weather-forecast models that predict the weather within the next few days, global-climate models can develop projections for how the climate will change over the next few decades. And just as we know that weather-prediction models sometimes yield the wrong answer, climate models also have their limitations. So, how do we know that today’s climate models are good enough to make accurate predictions of the future? The test for climate models is to see if they can reproduce the climate of the twentieth century, for which there are lots of observations for comparison. We start the model in the year 1900 and simulate the climate for one hundred years. 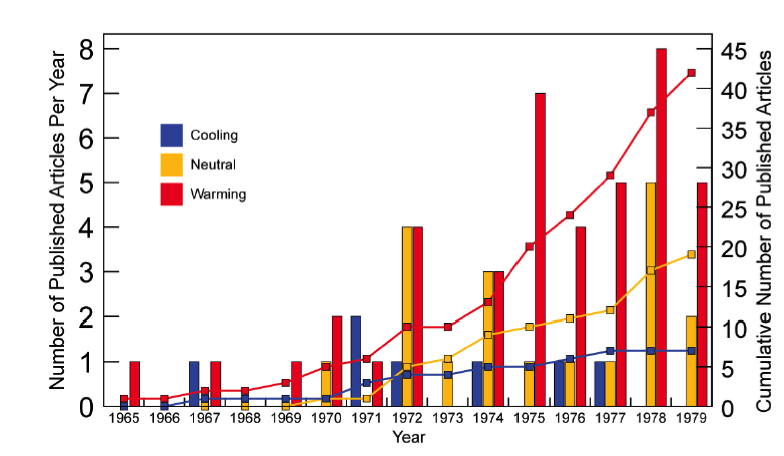 We can also run experiments where we pose different questions, such as, “What would the climate of the twentieth century be like if humans were not around?” The results of such a series of experiments are shown in Figure 1, where the thick black line indicates the observed global temperature, and the colors indicate the results of various climate-model predictions during the twentieth century. The blue shading indicates the global temperature in simulations that include only natural changes to our climate system, such as changes in solar radiation and the major volcanic eruptions of the twentieth century. 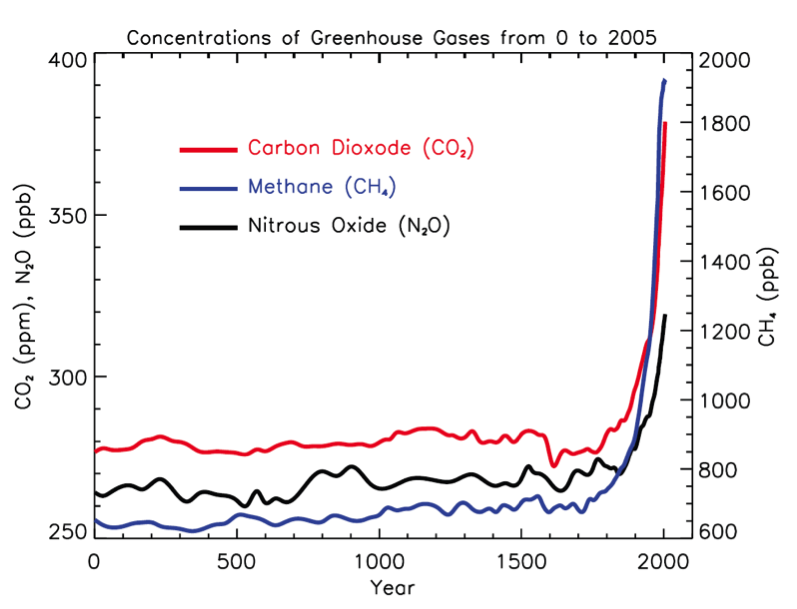 The red shading indicates simulations that include both natural changes and human influences (that is, emissions of greenhouse gases and aerosols). The model simulations that include both natural and human processes actually match the observations fairly well, whereas the models that neglect human-produced gases do not show the warming trend observed since 1970. These experiments therefore demonstrate two important points. First, it is very likely that human-produced greenhouse gases are responsible for a large fraction of recent warming, especially over the last fifty years.2 And second, they provide us with confidence that model predictions of the next one hundred years will have some legitimacy. 1. Decadal averages of observations are shown for the period 1906 to 2005 (black line) and blue-shaded bands show the range for simulations from five climate models using only the natural forcings due to solar activity and volcanoes. The red-shaded bands show the range from fourteen climate models using both natural and human forcings. Forcings refer to processes that will act to either warm or cool the planet such as changes in the sun’s radiation or changes in the concentration of a gas like carbon dioxide. Forcings can either be natural (e.g., volcanoes that act to cool the planet, or increases in the sun’s radiation that would warm the planet) or human-produced (e.g., increases in carbon dioxide that will warm the planet, or increases in aerosols that will cool the planet). IPCC, Solomon, et al. (2007), adapted from Figure SPM.4.